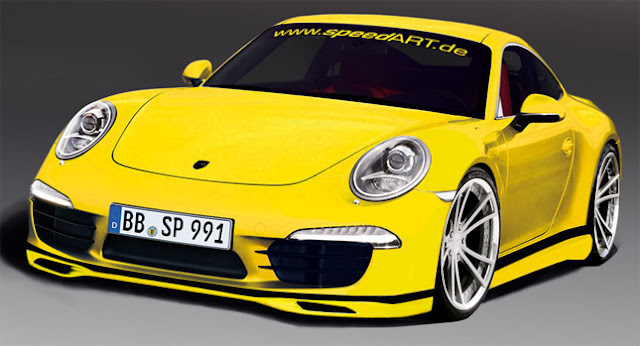 SpeedART has released the first details about their upcoming tuning package for the 2012 Porsche 911 (991) Carrera S. On the styling front, the SP91-R has an aerodynamic body kit with a front lip spoiler, extended side skirts and a rear diffuser. There's also a bespoke interior, a sport-tuned suspension and 21-inch LSC-FORGED alloy wheels. For added performance, the car will be equipped a sport exhaust system and a power kit which enables the engine to produce up to 435 PS (320 kW / 429 hp). More information will be released at the Essen Motor show in November, so stay tuned for updates.